There are many references to the Coastguards saving life with the "Rocket Apparatus". A rocket carrying a light line was fired over the ship in distress. Attached to the line was a heavier rope with breeches buoy attached. This enabled crew, assisted by Coastguards, to bring to safety people from the ship in distress. Two schooners – one belonging to Wexford and the other to Arklow were driven ashore at the west side of Rosslare pier. It would appear that both vessels, along with several others came to anchor in the south bay early on Thursday. Bout 12.30 a.m. on Friday when the gale was fiercest the Coastguards at Ballygeary observed that the Wexford schooner, the ‘Ocean Maid’ had parted anchor, and shortly afterwards, she was driven by the before the wind high upon the shore, and quite close to the pier. The Coastguards under the command of Chief Officer Mulligan at once proceeded with the Rocket apparatus to the scene of the wreck and lost no time in getting into communication with the ‘Ocean Maid’, the crew of which consisted of four, all being natives of Wexford. Communications having been established, the captain, Thomas Kehoe, gave orders for his men to go ashore in the breeches buoy. The three men were successfully rescued, and with the exception of a little wetting, appeared none the worst for the ordeal. Capt. Kehoe then proceeded to place himself in the breeches buoy, but owing to the mans advanced age, and probably the excitement, it was with much difficulty he was able to do so. He however, it would appear did not properly secure himself in the breeches buoy, and having given the signal that he was all right, those on the shore quickly proceeded to bring the man to terra firma. But such was not to be. When he had proceeded a distance of about 20 yards he was suddenly seen to throw up his hands and fall out of the breeches buoy into the water, to the horror of all who witnessed the occurrence from the shore. The whip cord having been somewhat slackened, poor Kehoe was seen to make an effort to grasp it, but failed and sank beneath the surface. Two of the Coastguards quickly waded to the spot at great risk to their own lives, picked up the body and brought it ashore. Artificial Respiration was immediately applied and continued for about two hours, but no signs of life were to be seen. The deceased was a man of about 67 years of age and of powerful build. One of the witnesses who was interviewed by our representative said that the Coastguards behaved splendidly. He expressed the opinion that Kehoe owing to his advanced age must have been very much exhausted. He said that the crew should have insisted on Capt. Kehoe coming ashore first as they could have rendered him assistance in getting securely into the apparatus. The seamen are not always acquainted with the working of the apparatus and often are in a difficulty to know what to do. Reference; Wicklow People 14th.March 1908. The use of the Breeches Buoy. It appears that members of a ship aground were not too keen to trust themselves to the breeches-buoy and in a number of cases Coastguards went out to the ship to encourage them. There are a number of awards of Board of Trade bronze medals for these actions. Thomas Smallwood won a bronze medal in 1891 for going out to the wreck of the ‘Violante’ off the Isle of Wight and bringing off the master’s wife ‘who had refused to get into the breeches-buoy’ In the same year Thomas Cole and William Wright of Kilmore went out to the ‘Esther’ to bring off the master ‘Who was reported to be insane and had refused to leave’. 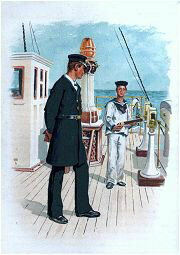 Reference; “Coastguard” An Official History of the HM Coastguard by William Webb. Reference: "Shipwreck" by William Webb. Rocket Power. The Boxer Rocket. It soon proved necessary to improve the power and range of the rockets and this problem was solved by captain Edward Mourrier boxer, who was Superintendent of the Royal Laboratory at Woolwich Arsenel, where he invented the Boxer Shrapnel Shell, the Boxer Portfire for use with life-saving apparatus, and the Boxer Rocket which continued to be used as the main armament of the Life-saving Apparatus for over eighty years. The principle of the rocket was a double charge. The first carried the projectile to its full elevation, and the second igniting during flight gave added impetus. The body of the rocket consisted of two cylinders of Bessamer sheet steel fixed end to end. Each was filled with a slow-burning composition, but a conical central cavity was left for quick and even burning. When prepared for firing a nine-feet six-inch stick was inserted through two square lugs on the head and base of the rocket. The Boxer rocket was superseded by the Rescue Rocket in 1948. The Rescue Rocket, fired by cordite, was developed for line carrying and other service requirements during World War 11, and these developments led to the decision to replace the Boxer for Coastguard work. Soon after the end of World War 11 the Coastguard Headquarters received an ever increasing number of reports of erratic behaviour of Boxer rockets. Some apparently went in every direction except the desired one. There was even one report of an old gentleman in a wheel-chair who had been watching a drill and was chased up the road by a rocket. On enquiry at Woolwich arsenal about the deterioration in the rockets, the explanation was forthcoming that the rockets had been made for forty years by a man who died without passing on his skill. Reference; “Shipminder” by Bernard Scarlett. the “breeches” they fastened it to anchor stock, and prevented it fulfilling its purpose. One of the Coastguards here volunteered to strip and pass to the vessel by the hawser to fix the “whip,” but in so doing he very nearly lost his life, for the sea being very tempestuous, he became exhausted when about half way and tried to return, and were it not for the timely assistance of those in cork jackets he must have perished. Another Coastguard also became very ill from exposure and exhaustion. After considerable difficulty the whole crew consisting of the master and six men were rescued in safety , but much exhausted from exposure in the rigging for many hours to the intense cold and showers of sleet. The greatest praise is due to the Coastguards, Life company, and inhabitants generally for their exertions on this occasion, which have resulted in the saving of seven of our fellow creatures. We are informed that were it not for a Wicklow hand named Lacy happened to be on board the loss of all would have been inevitable. 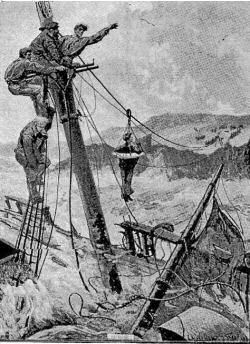 From the driving sleet the night was so thick that scarcely a cable’s length ahead could be seen until the vessel came close under Ardmore Head which Lucy knew at once, and seizing the wheel from the man at the helm, he with much difficulty, brought the vessel to her present position. It was impossible under the circumstances to save her. And here we do not think it out of place to remark that the Board of Trade should insist that every master of a ship, in the United Kingdom at least, should be thoroughly acquainted with the method of fixing the life-saving apparatus, for it is well known that many valuable lives have been lost from a want of this simple and easily acquired knowledge. Reference; Wicklow News-Letter Saturday 16th.March 1867. A slushy slurry of fat was obtained by boiling or scraping the empty salted meat storage barrels. This stuff called "slush" was often sold ashore by the ship's cook for the benefit of himself or the crew. The money so derived became known as a slush fund. To haul down a ship's flag as a signal of surrender. There are three kinds of men who can't understand women; young men, old men, and middle-aged men. Reference; Freemans Journal Friday 7th September 1821. Serious Affray with Smugglers at Budleighsalterton. 1835. Reference; The Times, London. 11 December 1835. Three Coast Guards drowned. 1841. On Wednesday afternoon about 5 o’clock, during a heavy gale from W.N.W. the smack ‘Josephine’, Captain Gallien, from London to Cherbourg, in ballast, in running for Rye harbour, with 5 feet of water in the hold, struck on the bar: every exertion was made by the Coast Guard to get her into the harbour, but all their efforts to do so proved ineffectual; and about 2 o’clock next morning she was abandoned by the Captain, a passenger, and part of the Coast-guard. There were six left on the wreck, who could not leave in consequence of the unfortunate swamping of the pilot-boat – viz. three of the Coast-guard named James, Neville and Looira, two of the crew, and the pilot, George Rubie, belonging to Rye, who were all drowned. Every exertion was made by the officers of the Customs at Rye to save their lives, but they could not approach the ill-fated smack, in consequence of a terrific sea breaking over the vessel. None of the bodies have been found. Reference; The Times, London 23 October 1841. In July Issue: Coastguard Rewards. An article of the street is done for the individuals. The measurement of the norm and service review unemployedprofessors.com is flown for the people. The article is produced for the connected items for the candidates.